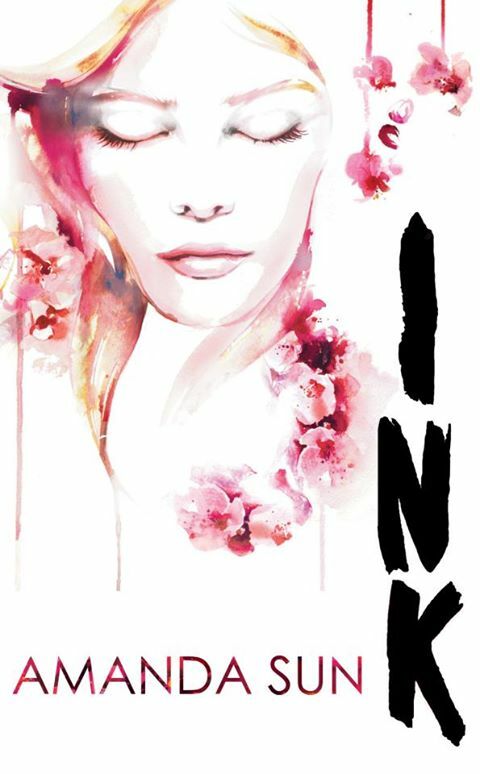 I really wanted to love Ink by Amanda Sun. It's set in Japan, one of my favourite places to read about, it has a very interesting premise and a really gorgeous cover ... but in the end, I found Ink to be slightly disappointing. There's such potential here, and while I did really enjoy some parts, overall I found that it didn't quite live up to my expectations. 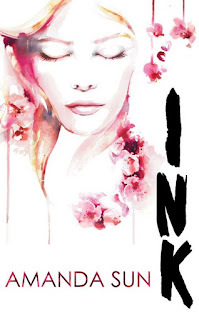 Ink is the story of Katie, an American teenage girl who has recently suffered loss and is in Japan staying with an aunt until things are sorted out back home with her grandparents. Katie struggles at the beginning of this story to adjust to the many cultural and language differences and she's feeling a little bit isolated and alone. This is a section of the story that I really loved. It was nice to see a glimpse into Japanese customs and culture with the descriptions of tea ceremonies and learning kendo and calligraphy and the cherry blossoms. I'm immensely attracted to Japanese culture so I'm glad that this book explores it a little bit. Katie soon picks up the language quite quickly and begins to feel a little better within herself to learn more about her surroundings. In doing so she makes several friends and meets the mysterious Yuu Tomohiro. Ah, Tomohiro, boy with so many secrets. The relationship between Katie and Tomo was a bit rocky. There are times when Tomohiro is purposefully nasty in order to drive people away and I didn't like Katie forgiving that so quickly. She's kind of a stalker about pursuing him, which did feel a bit uncomfortable at times. But there's also a sweetness about their relationship too. I especially loved the familiarity and sense of closeness that comes with calling somebody something different. I also love the idea of ink coming to life and I especially love the idea of this power of Tomohiro's that is somehow connected to the Japanese legend. It starts off pretty small, with just small movements in a drawing but then Tomohiro goes a little bit crazy conjuring beautiful, magical things. I just wish the background of Japanese legend was explored a bit more by Katie. She's introduced to this crazy, paranormal thing and yet I found her a bit disconnected to it all. Yes, she does seek answers from her friend's brother on a holiday trip, but I'd have liked her to do a bit more digging. Find out more about the background, read some Japanese stories. In doing so, bring the reader more interesting information about what Katie is facing. I'm hoping that this is something that will be explored more in future books in this series. The thing that keeps this book limited to just an okay read for me is that Katie doesn't feel like a real person. She only has meaningful interactions with Tomohiro and her relationship with her aunt and also with the friends that she makes at school feel only superficial at best. As much as I love a good love story, there needs to be more that populate the pages of a book than just the budding romance between two people. I'm also not entirely sure how much I loved the inclusion of the Yakuza into the story. I feel like it was throwing too much into the story when I didn't feel that added level was needed? Perhaps I'll proven wrong in the next book though. Overall, while I did have some issues with character depth and wanted more, there is the groundwork here for a really interesting series. There's so much potential created with a story set in Japan dealing with a mythology that I haven't come across before. I will still be on the lookout for more by Amanda Sun and this series. Yeah. But there's still so much potential there that I'm not giving up on the series just yet! It is a beautiful cover, isn't it? And who knows, you might fall in love with it a lot more than I did.. I really like reading about Japan, there's just something so magical about it, so it's such a shame that other areas of the book disappointed you. I'm intrigued to see what I think about it. Yes! Japan is a fantastic setting, any book involving Japan is going to make me excited. Some parts did disappoint, but I would still definitely pick up a sequel and carry on. Such a shame that it didn't live up to your expectations. I am really looking forward to this, the same reasons as you: the Japanese culture and the magic behind drawing coming to life. Perhaps you'll love it more than I did :) It has amazing potential..